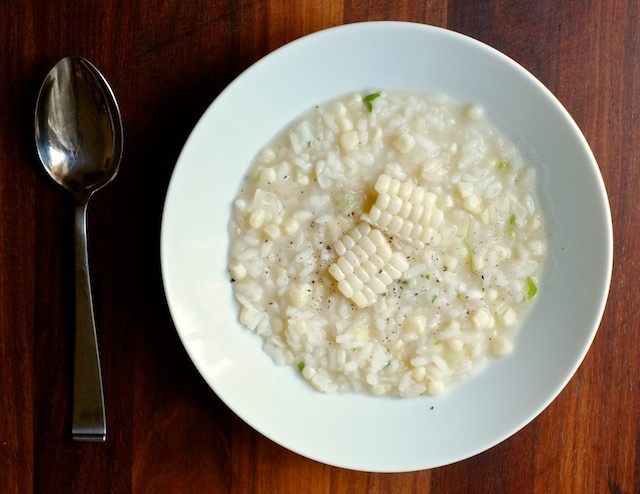 Risotto is one of those dishes that’s known for being labor intensive, but the “labor” part of risotto-making is just stirring, which is really sort of meditative and intuitive and definitely nothing to be afraid of. You don’t even have to measure your ingredients, just stir and watch and take a few tastes when you think the rice is getting close to done. 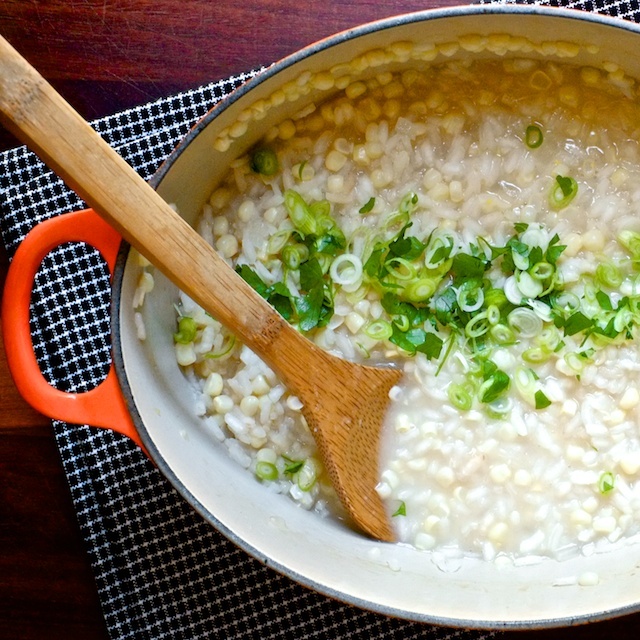 The main thing to know about risotto is: use the right rice. I tried making this the first time about eight years ago with basmati rice. Because I was an idiot. The end result was decidedly not risotto. More like a rice ball. 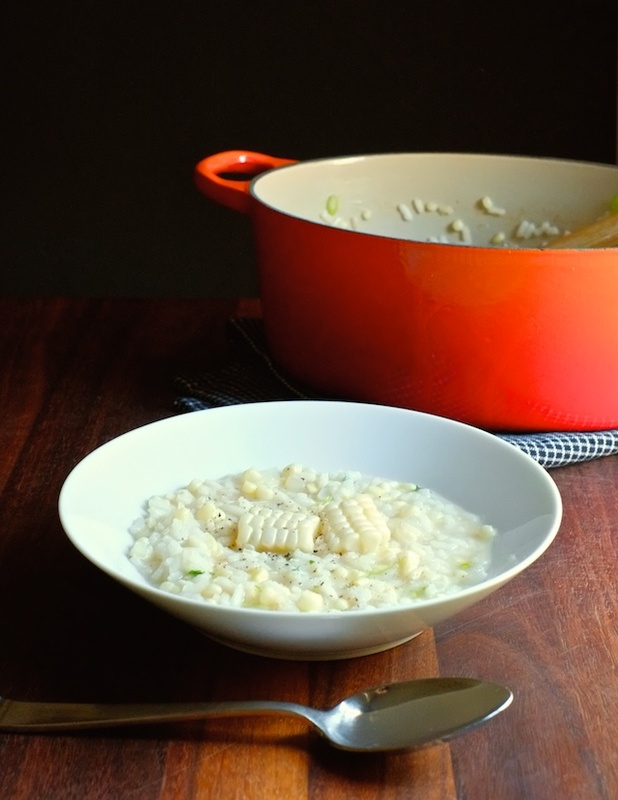 Arborio and carnaroli rice are the classic Italian picks for risotto, but I’ve used Japanese rice successfully, because it’s short-grained and similarly starchy. The other thing to keep in mind is that your cooking liquid is going to reduce while it’s cooked into the risotto, so any seasoning you add will be concentrated. Keep a light hand with the salt until the risotto is almost done, or you’ll risk over-salting. That’s it though: the right rice, and a low-salt broth. It’s a weird thing for me to admit, but this is the first risotto I’ve made that I didn’t want to embellish with cheese. I needed this to taste like corn on the cob – just buttery and sweet. And I think cheese would have drowned out the delicate corn flavor. Yes, I spiked it with green onion, (for brightness) but overall this is just sweet butter and corn in a luscious little belly hug. Also probably the whitest corn ever grown. Not so easy to photograph. Can you even tell it’s corn? If you’ve never made risotto before, I think it’s helpful to watch a video to see how simple the adding liquid/stirring process is. 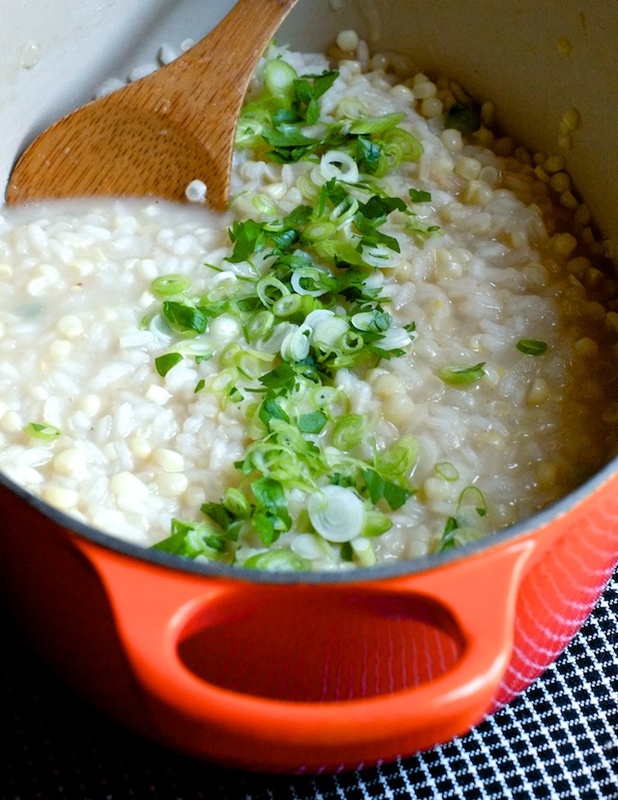 Here’s a video for “golden risotto” on saveur.com. I love that the only way to really know if risotto is done is to get in there and taste it. No timing, no measuring, just pour and stir and pour and stir and taste. 1. 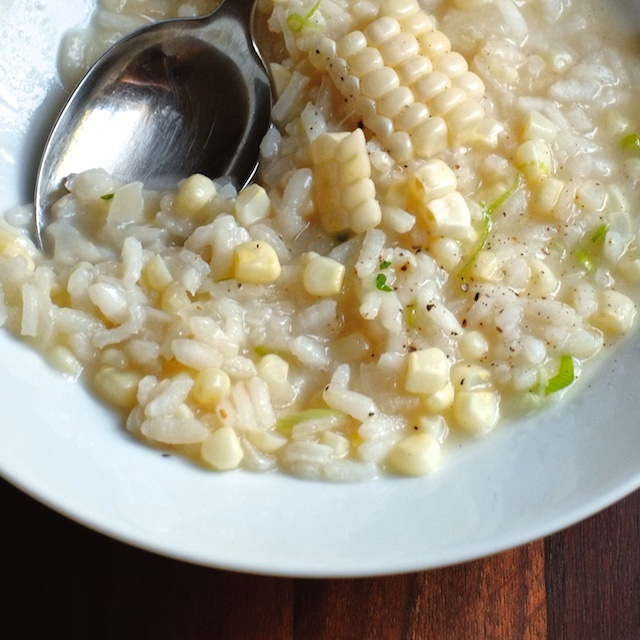 Cut raw corn from cobs and reserve in a bowl. Put leftover cobs in a pot and cover with water (about a quart, a little more is ok). Add 1-2 cloves smashed garlic and simmer, covered, for about two hours to make corn cob broth. 2. When broth is finished, remove garlic and corn cobs and scrape any cob pulp into the broth with a spoon or butter knife. Season lightly with salt, and keep on low heat. This liquid will reduce as it’s added to the risotto, so be very careful not to over-season the broth. 3. Sauté onion in 1 Tbsp butter over medium heat in another pot. When onion is translucent, add arborio rice and stir until rice is lightly toasted. 4. Begin by pouring white wine over rice and cook, while stirring, until the wine is mostly absorbed. Then, start adding corn cob broth a ladle or two at a time, stirring constantly. Allow the broth to absorb almost completely (there will be some creamy starchy sauce surrounding the rice) before adding another ladleful. Keep adding broth, stirring, and letting the liquid absorb in turns until the rice is al dente (not crunchy, but with a pleasant chew – it shouldn’t be sticking to your teeth or anything). Stir in reserved raw corn and allow to cook another minute or two. 5. When the rice and corn are done, remove the pot from the heat and stir in 1/2 stick butter. Taste and season as necessary with salt and pepper. The finished risotto should be somewhat loose (like it would spread a bit if you put it on a plate) but creamy, not watery. Add another touch of corn broth if necessary to loosen the risotto slightly. Top with scallions and parsley, maybe a bit of raw corn, and serve.